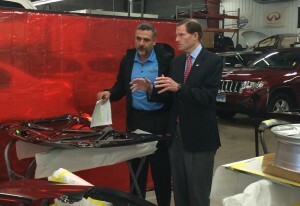 U.S. Sen. Richard Blumenthal, D-Conn., visited a Connecticut collision repairer Saturday to tout his recent request for a federal auto insurance investigation, the New Haven Register reported. The event at Wallingford, Conn.-based A&R Body Specialty and Collision Works, also offered media a dramatic demonstration of the potential difference between non-OEM and OEM parts, according to the Register. Blumenthal’s Feb. 13 letter calls for investigations into the use of aftermarket and recycled parts by insurers, the alleged practice of “steering” policyholders to certain shops, and whether the 1963 Consent Decree between the government and insurers still applies — particularly as it related to several complaints auto shops have today about insurers. “Consumers and auto repairers possibly remain victims of the very same misconduct insurers were directed to stop doing decades ago,” wrote Blumenthal, who was recently featured in a controversial “Anderson Cooper 360″ report about auto insurance. He cited the “AC360″ story Saturday, the Register said. Another highlight of the event, according to the Register, was New Haddam, Conn.-based Eddie’s Auto Body Specialists owner Ed Lupinek bending an aftermarket bumper reinforcement beam with his pinky. The original equipment manufacturer part, which costs $90 more, couldn’t be bent, according to the Register. Blumenthal also accused insurers of encouraging customers to use direct repair program shops which provide lower quality work and parts, while it should be “your car, your choice,” according to the Register. While Connecticut law allows a policyholder to go to any shop they want; insurers have been accused of “steering” customers to lower-quality shops, badmouthing more expensive shops without merit, and implying that DRP shops are the only option. Repairer Driven News will continue to seek more comment, images and video from the event. Continue to check for updates.